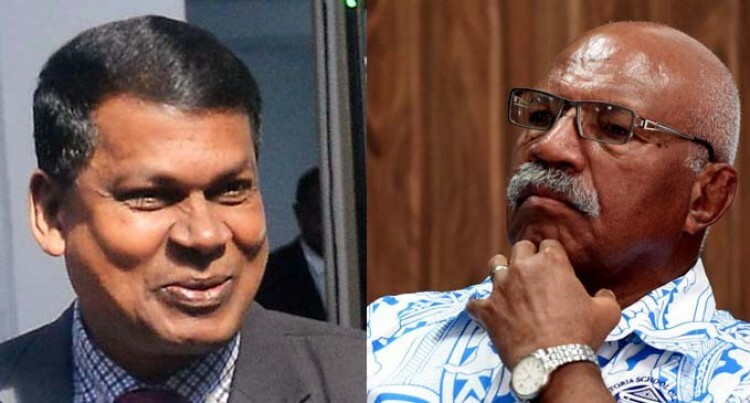 Can Sitiveni Rabuka and Biman Prasad work together? Do they have the leadership ability to continue to take the country forward as FijiFirst is doing? These are the questions that will be faced in the unlikely event that SODELPA and the National Federation Party win enough seats to form a coalition Government. That will be a political marriage of convenience – because right now NFP wants to fight the election alone. It rejected an invitation to be part of a SODELPA initiative for a coalition with the Opposition parties. Fiji Labour Party, People’s Democratic Party and Fiji United Freedom Party joined the unity move. In this current parliamentary term, the relationship between SODELPA and NFP, has ended on a sour note. Their big challenge in the unlikely event of elction success will be to try to reconcile their differences and their egos. SODELPA and the National Federation Party may appear to have the best prospects to form an alternative government to FijiFirst. But the reality is that while their MPs sit side by side in Parliament their seemingly peaceful relationship belies the deep suspicion and division that exists between them. In fact the ties that originally existed have been cut. NFP leader Biman Prasad’s exit from the Public Accounts Committee chairmanship and the termination of his role as the Opposition Economy Shadow Minister were the final nail in the coffin. The NFP will now only explore any possibility of a united front if it will benefit from it. Otherwise, it seems confident of fighting its own battle. That’s Mr Prasad’s position. SODELPA leader Sitiveni Rabuka, however, has a slightly different outlook. He has his doors wide open for any possibility of unity because experience has taught him that there is safety and strength in having the numbers. Both parties have their own internal problems. NFP is still recovering from the departure of former president Roko Tupou Draunidalo. While it has tried to change the party’s image to a multiracial party, it remains as basically a predominantly Indo-Fijian party. The entry of Pio Tikoduadua as the new president has not caused significant changes to the party’s support base. SODELPA is going through intense rivalry for party election tickets that could threaten the solidarity of its election campaign machine. Mr Prasad is on record stating he will become Prime Minister if NFP wins the elections. Lautoka lawyer Faizal Koya has already been slated to fill in as Fiji’s Attorney-General in the unlikely event. Over at SODELPA Mr Rabuka no doubt is thinking along similar lines. He becomes Prime Minister and his loyalist Niko Nawaikula becomes Attorney-General in that unlikely event. Both want to restore the Great Council of Chiefs. Both are quiet on whether the distribution of lease money will be reverted to the old system of chiefs getting a larger chunk. Both want $5 an hour as minimum wage rate. More people will be unemployed in the unskilled sector. Both intend to keep the Tertiary Education Loan Scheme (TELS) which was introduced by the Bainimarama Government and continued to be made better by the FijiFirst Government. But they intend to turn it to scholarships for some students. Both want to increase the civil service retirement age from 55 to 60. Their “trump card” seems to be the removal of civil service contracts and a return to the old ways of a civil service that lacked accountability and transparency. They side with unions who are advocating across the board pay rise instead of a merit-based system. The people become the losers if we go back to the past. SODELPA is against leasing of land for 99 years with another renewal of 99 years.